I recently picked up bouldering and bought my first pair of shoes as well as chalk and a bag. I've only been climbing in the gym for now and handled the equipment like any other gym-sports-equipment: I put it in my bag where it is safe from rain etc. that I might encounter on my way to the gym. Soon I will travel to another city. My backpack is completely filled and the only way to take my equipment for bouldering with me is attaching it to the back or the sides of my backpack. As the weather-forecast does not look too promising I am wondering if it is alright for the shoes to get wet. The chalk-bag should - in theory - be waterproof, but I prefer being safe over being sorry. To summarize: Is it ok for my climbing shoes to be directly exposed to the rain and how bad would it be if the chalk-bag would leak some water inside? Mostly fine. A bit of rain is not going damage your shoes. I've gotten mine totally sodden before now. It's also fine to wash them. Trust me you may well want to do this after a couple of months. Just make sure you dry them well to prevent them from getting mouldy. That's your worst risk. This isn't going to happen from a rain shower though. Again, not the end of the world. If the chalk (not the bag) gets really wet it's going to become unusable though. It will turn into a weird gooey chalky mass. But chalks relatively cheap, you can always replace it. Also fine to wash your chalk bag. Again, just dry it well before use. In addition to @Liam's fine answer: The usability of both chalk and shoes will be severely limited while wet, e.g. friction is extremely reduced and you will slip. Chalk will lump. Your shoes will be completely fine when dried. They get all the time at least a little moist from sweat, they are designed to withstand that. With chalk, it will depend on the mix, but most types will probably be usable when thoroughly dried. Of course your outdoor equipment has no problems with getting wet. It's not getting any damage if used in rain. While wet the function of your gear may be influenced, e.g. in the case of rubber soles and chalk this will be inevitable the case. Your gear is designed and exists to be used outside where it may rain. Even back in the old days when they started climbing steep rock with the newly designed rubber soles they got wet. Back then climbing gyms weren't available and people even couldn't imagine that some decades later hundreds of people crowd up in tiny rooms to climb on plastic walls. So don't be afraid of wet gear, just treat it right. Dry it properly, especially if you are hygiene-conscious. 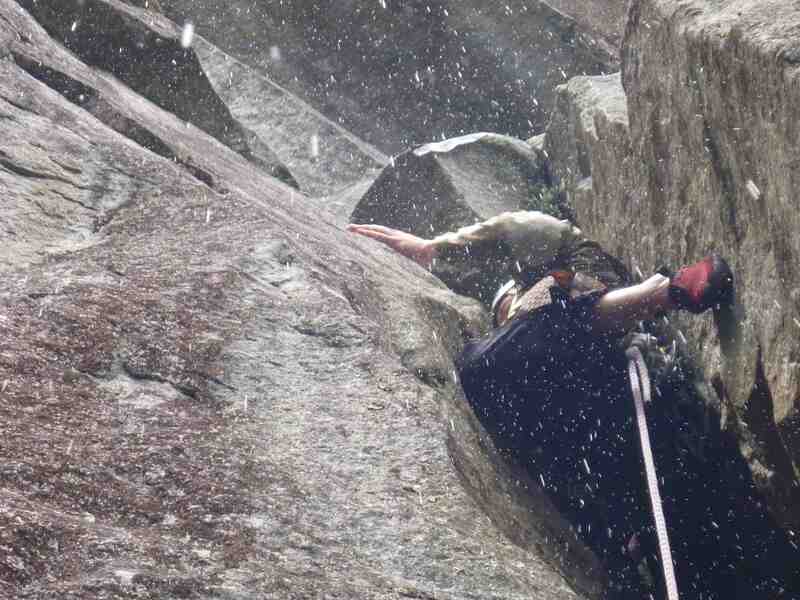 And avoid to go climbing outside in bad weather, except you really know what you are doing. Not the answer you're looking for? Browse other questions tagged rock-climbing gear-care climbing-shoes wet-gear climbing-chalk or ask your own question. Why go without socks with climbing shoes? Are used climbing shoes safe? How to find climbing shoes for toe and heel hooks? Are my climbing shoes worth repairing? How to contain the stench of climbing shoes?